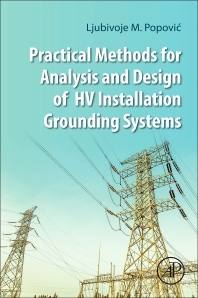 Practical Methods for Analysis and Design of HV Installation Grounding Systems gives readers a basic understanding of the modeling characteristics of the major components of a complex grounding system. One by one, the author develops and analyzes each component as a standalone element, but then puts them together, considering their mutual disposition, or so-called proximity effect. This is the first book to enable the making and analysis of the most complex grounding systems that are typical for HV substations located in urban areas that uses relatively simple mathematical operations instead of modern computers. Since the presented methods enable problem-solving for more complex issues than the ones solved using National, IEC and/or IEEE standards, this book can be considered as an appendix to these standards. Born in Serbia in 1944, graduated (1969) and received Master (1983) and Doctor (1991) degrees, all at the School of Electrical Engineering, University of Belgrade, Serbia. In 1969 joined the Electric Power Distribution Company of Belgrade, where he stayed until retirement in 2007. In 1999 he was elected an associated professor at the School of Electrical Engineering, University of Belgrade and in 2010 he was elected an IEEE R8 Industry Lecturer (Industry Continuing Education Program). In addition to realization of the numerous studies and projects, he also developed a number of technical standards and guides in the area of power delivery. He published over 100 papers in home and international journals and proceedings of international conferences, two chapters in two international scientific books and one scientific book under the title: Actual Parameters of Power Lines Passing through Urban Areas (LAMBERT, Academic Publishing, 2015). His work had an impact on some of the IEC publications (Technical Report IEC 60909-2, Ed 1(1992-09) and IEC standard 60909-3, Ed 2 (2003-09)) and was highlighted by Vertical News, High-beam Research, High-beam Business, GOLIATH Business News, News-edge and is presented through scientific network Research Gate. He was elected a member of the IEC Technical Committee – IEC/TC73- Short Circuit Currents. A member of IEEE since 1987, he became Senior Member in 1991 and was the Chair of IEEE PES Serbia and Montenegro Chapter from 2002 until 2009. He received National Nikola Tesla Award in 2006, IEEE PES Chapter Outstanding Engineer Award, and Certificate of Appreciation for Notable Services and Contributions towards advancement if IEEE and Engineering Professions.